“…I feel like God is glorified in every step of the journey. Every moment that you experience this life and every day that you’re battling whatever you’re battling, you’re overcoming it. Every day you’re doing that, every step, is really where the glory is, and that’s where God is [most] glorified…” Musically reminding me of pop/CCM artists like All Things New, Big Daddy Weave and Sidewalk Prophets, Among The Thirsty are the newest signings to BEC Recordings, and unveil their debut album Who You Say I Am this week. Comprising of friends Ryan, Brock, Brian, Riley and John, the quintet deliver 10 honest, emotional and powerful melodies, each poignant and compelling and that have me singing at the top of my lungs as I praise Jesus for who He is. 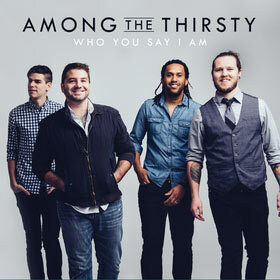 While some listeners may think that another CCM/pop band isn’t what we all need, let me dive in to remind you all just why Among The Thirsty’s album is one of the most revealing and honest of 2015, even if it isn’t the most musically creative, and deserves a listen before we all jump to conclusions and label their music as uninventive. Opening the album is the promotional single “What Love Looks Like”, in which the band dive deep and tackle a relevant message that sets the tone for the rest of the album. Driven by stirring piano, lead singer Ryan asks the question about what does love look like, and surmises in the chorus that ‘…maybe it’s a Father working through the long night, maybe it’s a Mother trying to raise her kids right, maybe it’s a prayer on a long drive home, maybe it’s a soldier fighting on the front line, maybe it’s a preacher laying down his own life, maybe when You gave Your Son to die that’s what love looks like…’. Vocally similar to Dave Frey from Sidewalk Prophets and Mike Donehey from Tenth Avenue North, Ryan passionately sings from his heart, and the mid tempo ballad hits all the right notes thematically and musically, tugging at my emotions and heart. Inspiring me to be the love of God in my community and to those around me, so that those who don’t know Him can be shown a little of Jesus through me; if you thought this song was moving, then the next single is even more so! Filmed as a music video earlier this month, Among The Thirsty’s official debut single “Completely” is one of my favourite songs on the album, as the CCM/pop ballad, led by captivating keys, explores the notion of surrendering 100% to God in all circumstances, no matter if we are feeling happy or sad. As Ryan outlines that ‘…I am completely surrendering, finally giving You everything, You’re my redeemer, I run to the cross, because You are more than enough…’, there’s a sense of longing to reach that goal of being totally reliant on God. To me this song is a prayer for myself, so that I can learn to trust God completely and not worry; well done guys for these two brilliant singles that highlight the great songwriters that these men of God are! The rest of the album on the whole is musically and thematically similar to the two album singles, which can be seen as a good or bad thing. Some listeners may claim that these song is as CCM as you can hear on the radio, but as a lover of CCM, my viewpoint is slightly different, as although the music of these tracks are mostly similar to each other (piano ballads mostly), it is the lyrics that bring a smile to my face, acknowledging that these guys are talented writers! The title track is a contemplative piano ballad that has Ryan looking inwards, reiterating the fact and claiming the promise that ‘…You call me righteous, You call me yours, no longer guilty, not anymore, I am rewritten, I’m spoken for, a new creation now I stand cause of who You say I am…’. With such powerful words sung with equally impacting enthusiasm, the song starts off slow, then continues to an epic and swelling crescendo, as the big and full instruments complement Ryan’s soaring vocals and the poignant subject matter of being a new creation nicely. “Trust” is next, and is a potential single where Ryan channels his inner Needtobreathe vocally, as this southern gospel/country/pop inspired song encourages us to trust in the promises of God. As we sing out with Ryan that ‘…I’ll trust in every promise that you made, oh Your love’s not fading, it’s never changing…’ we are gently reminded that we can stand firm on the promises of God as He has been faithful to His word time and time again! “At The Cross” is yet another ballad (some listeners would be sick of the similar musical structures already! )- this time an acoustic guitar and piano only ballad, that vividly describes Jesus’ death and resurrection, in which Ryan’s emotional and stirring vocals bring me chills (seriously, this song needs to be heard over and over for the message to sink in! ); and “Over And Over”, led by the electric guitar, is a reflective and contemplative inspirational melody that beautifully depicts the notion of Jesus picking us up when we fall and loving us always, that ‘…over and over, I fall apart but You keep on loving me…I break your heart but you just keep loving me, and I know that you won’t let me go…’. But just when you think the whole album is a ‘ballad-fest’, Among The Thirsty pull some rabbits out of their hat! The bouncy, energetic piano pop 3 minute tune “Beautiful Life” is a little cheesy and cliché, as the band put on their Anthem Lights hat (and shades of Steven Curtis Chapman) vocally, and reiterate that we can’t miss any moment in life, as it is all beautiful and all meaningful; while the Matthew West vocal-esque piano led groovy piano prominent jazz and soul themed melody “Do It For You” speaks about bringing glory to God in whatever we do, that in everything ‘…I do it for You, whatever how big or small, Lord let it all bring glory to You…’. The album closer “How You Love Me” is as close to a rocker as you can find on this album, as Among The Thirsty jump out of the box musically and utilise the electric guitar brilliantly, fervently crying out and singing about the fact that Jesus loves us all immensely ‘…from my head to my toe, You are so high above me, and You see so much more than I know…’, and that His love for us never fades or changes. While “Never Leave You” is a tad faster than the average ballad, and has the band ardently providing us hope and reassurance of Jesus’ presence in our lives when we do not feel him in our lives. Reminding us that Jesus is ‘…the hands that bled for the sinner’s death…’, and that ‘…He’ll never leave you…He’s never far away, His love is living today…’, I can smile at the eternal truths present in this song and all the others, as I give this album a big ‘thumbs up’ in terms of enjoyability. “…At the core of all of our music is what God has done for us and what God is doing in our lives. We fear God in a healthy way. He’s given us this [platform], and we want to give it back…” Among The Thirsty’s debut album may be more ballad heavy than more energetic pop and rock songs, so if you are iffy about CCM, then maybe Who You Say I Am will grow on you, maybe not. But one thing is for sure- these guys are great lyricists, no doubt about it! I encourage you all to listen to the album and make up your own minds as to whether this album is for you. Or at least watch the music video for “Completely”… Well done Ryan, Brock, Brian, Riley and John for a compelling and enjoyable album; and I look forward to many, many more albums in the future! I’m totally loving this album Josh. I have so many favorites: Completely, Trust, At The Cross, What Love Looks Like, How You Love Me and Do It For You. The songs, in my opinion, have been well compiled to bring out this beautiful album. The songs have got me dancing at my workplace. Well done Josh for the review. Thanks, glad you like the review, and the album! I am sure with time, I will love the album like you do!